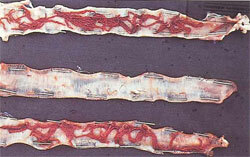 Gapeworms (Syngamus trachea) are included under ‘respiratory system’ since the adult worms reside in the trachea (or windpipe) and often produce a gurgling or ‘tracheal rattle’ that can be confused with respiratory problems. 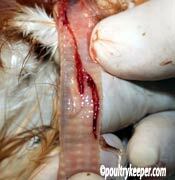 Gapeworm is common in pheasants but also affects chickens, guinea fowl and turkeys. Gapeworms can cause considerable losses in pheasants and turkeys. Gasping for breath or ‘gaping’ as it is known is the biggest sign of gape worm. Shaking of the head and neck stretching are also common. When birds are held, gurgling can often be heard which is a ‘tracheal rattle’. Gasping for breath caused by gapeworms is often confused with respiratory problems. If a heavy infestation occurs, death by suffocation will occur. Gapeworm infestation can occur either directly by birds eating eggs that have been swallowed or coughed up by infested birds, or indirectly by intermediate hosts such as earthworms or snails. Young birds up to 8 weeks of age are particularly susceptible to gapeworm. Gapeworms normally live in the trachea (windpipe) but are also found in the bronchi and lungs. Typically, eggs are picked up from the ground or from intermediate hosts such as earthworms or snails. The eggs hatch and the larvae penetrate the intestine walls and move to the lungs and bronchi. It is here they go through a larval moult, before travelling up to the trachea. Male and female gapeworms attach to one another once they arrive here. This process takes around 7 days. Fully grown, they are ‘Y’ shaped and vary in size between 1 and 2cm long. They are blood-red in colour (as can be seen in the second photo which shows them in a post-mortem). Gapeworm lay eggs that get coughed up onto the ground or swallowed and passed out in the faeces. Flubenvet wormer is licensed for treating chickens with gapeworm. Other Names: Gapes, Red worms, Forked worms, Y worms or spelt with a gap Gape Worm. Symptoms: Gasping (gaping), yawning, gurgling / respiratory distress, head shaking, loss of appetite, and eventually coughing and choking. Area affected: Trachea (windpipe), bronchi and lungs. Transmission: Via intermediate hosts such as earthworms or snails and directly by birds picking up eggs that have been coughed up, or passed out into faeces. Diagnosis: Laboratory identification of eggs in faeces, worms found in trachea (see photo) by postmortem, some / all of the symptoms above. Prevention: A good worming strategy, rotating grazing areas, avoiding contact with ground where wild pheasants have been. Treatment: Flubenvet 1% 60g is licensed for treating gapeworm. For heavy infestations (high epg or ‘eggs per gram of faeces’ determined by laboratory worm count) usually on heavily used ground or with high stocking density, it is usually necessary to worm again a little before the prepatent period (the time it takes from being laid as a worm egg to being a mature worm of egg laying age) to reduce high infection levels. Rotating the pasture really helps to break this cycle. Prepatent Period: 18 to 20 days. Risk to Human Health: None known. Photos on this page are courtesy of Elanco.